There’s this video going around right now, shot by a British tourist in Italy, of a Renault Megane that seems to have had most of its plastic and rubber trim melted off by the 37°C/99°F heat. While I’m not disputing that the car clearly has some obvious heat damage, I don’t think the 99°F weather is all to blame, nor French car quality. Something more has to be up. Watching the video (which really isn’t much of an ‘incredible moment’), you can see how all the adhesive — and it looks like most of the rubber — of the side rub strip has melted away, leaving a drippy, gooey mess like gummy worms made of hot roofing tar. Parts of the plastic bumper look pretty severely melted, and the lenses for the side indicator repeaters and the large taillights are melted as well. There’s no way in hell this was caused by normal 100°F heat. ... which I don’t think is fair at all. Plenty of Renaults have been in 100°F heat before, and they somehow didn’t melt. 100° of ambient air temperature, while absolutely hot, is not enough to melt the plastic on pretty much any car not made of ice cream or wax. If it was, Phoenix would be about three feet deep in a multicolored viscous soup of taillights and bumpers. So, what is going on here? Why is this poor Megane the only car seemingly affected by the heat? It’s not clear exactly where the car is, but it’s possible it may be in an unfortunate spot where a nearby glass skyscraper is focusing the sun’s rays on it, like London’s ‘walkie-talkie’ building has done, melting a local Jaguar. 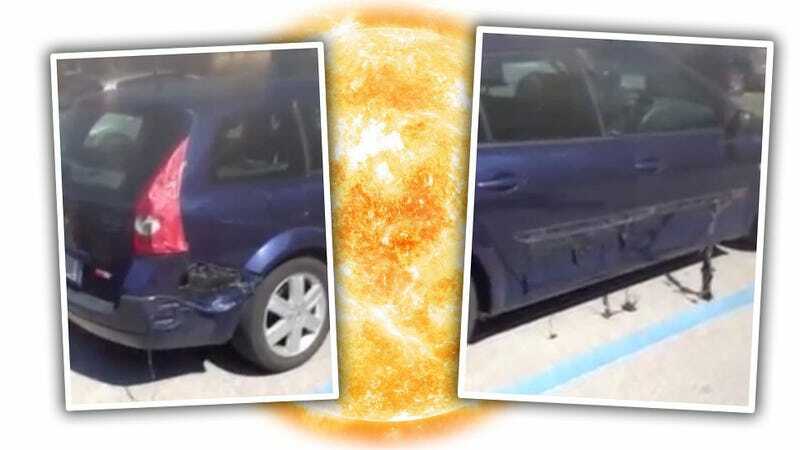 Honestly, that’s my best guess right now — there has to be something focusing the heat onto this car, because just a really hot day isn’t going to do this sort of damage, no matter how French the car. I have contacted Renault for their input and some definitive melting temperatures of the materials they use, and will update as soon as I hear back. In the meantime, Renault owners, I don’t think you need to refrigerate your cars.